As I remember I am meeting you for the first time after 21st November last year. My objective today is to clarify the prevailing political situation. However, in order to do that, it is pertinent to draw the attention to the Election Manifesto which paved the path for my appointment as the President on last January 8th. The transformation and democratic revolution that occurred on the 8th of January became a reality within a very short spell of forty-two days between my leaving the then Government on 21st November last year. It is within this short period of forty-two days that the people of this country nurtured the ideals of democracy, freedom, fundamental rights, human rights and the freedom of media, thereby giving us the opportunity to establish a new government. I offered an important Election Manifesto for ‘compassionate governance’- Maithree Palanayak. As much as the contents of the Manifesto, there were significant reasons in the background for people to select me as their common candidate. During the forty-nine years of my political experience, I have served the people as a Member of the Parliament, a Deputy Minister and also a Minister. During these forty-nine years, I believe that the People personally identified me as a person who respects and protects freedom and democracy, and as a person who did not engage in corrupt practices or abuse of powers. My character, my personality, the long experience I gained in my political career and the image I have developed in the hearts of the people are the reasons why they supported me and stood by me, when I took up the challenge as their common candidate. Before I left the Government on November 21st with the trust the People had, I had not met Mr. Ranil Wickremesinghe even once. I had met Madam Chandrika Bandaranaike only once and that too for less than an hour. I reached consensus with 49 organizations, political parties and groups to sign my Election Manifesto. Out of those forty-nine groups, it is only a few that I knew personally. My Election Manifesto and campaign was designed by the representatives of those forty-nine groups. Those aligned groups included mainly the United National Party (UNP), The Democratic Party of General Sarath Fonseka, the Muslim Congress, the Muslim National Front, while the Tamil National Alliance (TNA) and the Janatha Vimukthi Peramuna (JVP) supported me immensely without formal agreements. With their collective support we marked a tremendous victory. Just after the victory, around this time on the evening of the 09th of January, having taken oaths as the President, I took on my shoulders the responsibility of implementing the pledges and agreements I had made to the people in the Election Manifesto. Immediately after swearing in office as President, I appointed Mr. Ranil Wickremesinghe as the Prime Minister. There were only two agreements I signed before the Presidential Election. One was the agreement made between the forty-nine different groups who supported my campaign based on the contents of the Election Manifesto. Second was to appoint Mr. Ranil Wickremesinghe as the Prime Minister. Accordingly, I appointed Mr. Ranil Wickremesinghe as the Prime Minister. What was the nature of the Parliament when I made him the Prime Minister? Out of the 225 parliamentarians, only forty-seven belonged to the UNP when I appointed Mr. Ranil Wickremesinghe as Prime Minister. Today, in the present political environment, many who helped me to get into power and my well-wishers strongly criticize me for accepting the presidency of SLFP. They say that I should not have taken it over. I expected to swear-in as the President on the 09th and dissolve the Parliament on the 10th and conduct a General Election. I thought that was the most convenient option. However, the organizations and parties who organized my campaign jointly formulated my Manifesto decided otherwise. They believed that we should implement the 100 day Programme without dissolving the Parliament. You know that the 100 day programme was not a very easy assignment. It had promises to amend the country’s Constitution, to abolish or decrease the powers of the Executive Presidency and transfer those powers to the Parliament and Independent Commissions, other institutions and the Cabinet of Ministers. The question I ask from my friends who criticize me for accepting the SLFP leadership is, how I could have brought about these important changes like passing the 19th Amendment, erasing of Executive Presidency powers, with a Prime Minister having 47/225 parliamentarians. When I assumed office as the President, I came with both arms held high to erase the presidency and to reduce presidential powers. I was, I am and I will be this even tomorrow. That is my policy for freedom and democracy of the common man of my country. I assumed the leadership of SLFP on the 16th of January. I was sworn in on 9th January. I did not take it by force and I did not ask for it. Many senior leaders of the SLFP invited me to take over the leadership. They requested me to meet Mr. Mahinda Rajapaksa. As you know there was a 10-15 minutes long discussion with him at the Speaker’s Residence and I agreed to take the leadership. The Central Committee and Executive Committee met the following day and I was handed over the leadership. The United People’s Freedom Alliance (UPFA) led by SLFP had 2/3 strength in the Parliament. Accordingly, the President of SLFP is also the President of UPFA. Consequently, with 142 parliamentarians, I became the leader of the UPFA which has 2/3 members of the Parliament. Therefore, the success of 100 days programme was achieved. We were able to pass the 19th Amendment to the Constitution in Parliament. As the UNP says we were able to provide benefits to the people, salary increase to public servants, reduce prices of fuel, gas and food because I undertook the leadership of the SLFP and UPFA and led both parties to fulfill the tasks in the Election Manifesto. If Mr. Mahinda Rajapaksa became the party President, without my assuming it, he wouldn’t have allowed passing the 19th Amendment to the Constitution. The budget of the Finance Minister Ravi Karunanayake was unanimously passed in the Parliament. If Mr. Mahinda Rajapaksa was the President of the Party he wouldn’t have allowed passing the budget which provided benefits to people, salary increase to public servants, reduced fuel and gas prices or any other. The success of the 100- day programme which is now being appreciated was made possible with the leadership of the UNP, in collaboration with forty-nine organizations and parties which contributed to my victory. I should extend my gratitude to everyone who implemented it and voted for them in the Parliament. Two hundred and fifteen, out of 225 members in the Parliament voted for the 19th Amendment to the Constitution. Some people are now calling me a villain, traitor and betrayer. This is when blooming democracy is overflowing in this country after January 8th. No Head of the State or President who governed this country up to January 8th, especially after the establishment of Executive Presidency in 1978, was attacked in this way, as I had been attacked during past two weeks calling me villain, traitor and betrayer. I do not want to remind what happened to the journalists, how the media was strangled, and how free media was buried during some eras. You know what happened in this country, especially after the establishment of the Executive Presidency. Others also know it well. When Mr. S. W. R. D. Bandaranaike was transforming this country in 1956, by establishing a common mans’ government, democratically, ensuring labor rights and enforcing progressive policies, he had to face 459 strikes during his tenure of 3 ½ years. The Cabinet of Mr. Bandaranaike boycotted the Cabinet Meetings. When the strikes continued the then former Prime Minister Sir John Kotalawala said “Banda untied the dogs I had tied. Now they are biting Banda”. When some media organizations, political analysts and critics call me – the person who re-established democracy and led transformation, and was responsible for them- a villain, traitor and betrayer, I ask them to taste the fruits of democracy, but not destroy the democratic society created by the January 8th transformation. If those who attack me had used before 8th of January 1% of the words they use on me within six months, you know from past experiences what would have befallen on them. Everybody can guess what it would have been. That is the reality. It was a monarchy then. How were your media organizations advised before January 8th? You were told, “You can attack Ministers as much as you want, but do not attack any member of the Rajapaksa family”. There were no assassinations, blood shedding or conflicts during past six months. This country is now peaceful and free. This political management elected a Prime Minister with forty-seven members out of 225 members in Parliament. It passed the 19th Amendment to the Constitution and passed the budget unanimously. I emphatically wanted to do the required changes in the country. Due to these incidents, problems arose within the SLFP and UPFA. Though Mr. Mahinda Rajapaksa offered me the leadership, he pulled my leg after two weeks. I had to undertake a massive effort in the last six months to build the SLFP as a clean, pure party without family bandysm by freeing the party from the corrupted, who robbed state assets, engaged in corruption and fraudsters, as well as opportunists and people who misused power. On one hand I have had to lead a government with a Prime Minister who has 47 members in Parliament. On the other hand I had to change the Constitution by obtaining the 2/3 consent of the Parliament. The leaders of UPFA then held meetings against me, stating that 10, 25, 40, 50 stalwarts came on stage at their meetings. Whom did they challenge? They did not challenge the UNP. Everyone knew that they challenged me. Some people ask why I didn’t take disciplinary action against them; why I did not charge sheet them. The Central Committee unanimously agreed with the concept of the national government. The Parliament group took unanimous decisions without any objections. When they were taking such decisions and concurrently countered, the party, country and political rivals questioned why I did not take disciplinary actions against them; why I did not remove them from the position of organizers; why I did not I remove them from membership of the Parliament after disciplinary inquiries. But how could I do it? We had to continue with the Parliament with a Prime Minister who had 47 Parliamentarians. How could we pass a Bill in the Parliament and amend the Constitution? How could we pass the budget? How could we appoint Independent Commissions? Nothing could be done. I undertook to successfully implement the promised 100 Day programme while all these undisciplined acts were being done. To fulfill the responsibilities to the people of this country, I had to ignore these. I was very flexible. To my knowledge, no previous Head of State had been flexible like me, when members of his party behaved like this. I was flexible to fulfill the election pledges made to the people. That was to remove the powers of the Executive Presidency and to fulfill the promises and to pass the budget in Parliament. Today, we are facing a General Election in this background. The party that will be victorious will bear responsibility to the political stability, the management of the economy and the country for the next five years. Currently, there are three main allegations made against me for offering nomination to Mr. Mahinda Rajapaksa to contest under the UPFA. One of the allegations is that it was wrong on my part to have accepted the Presidency of the SLFP. I have answered that question. The next accusation is that it was wrong for me to have met Mr. Mahinda Rajapaksa. Thirdly, they say that giving the candidacy to Mr. Mahinda Rajapaksa for the next General Election is a huge fault. As all of you know, Mr. Mahinda Rajapaksa and I met three times. The first meeting was at the official residence of the Speaker to take over the Presidency of SLFP. The second meeting was held at the President’s Office in the Parliament with the representatives of both groups. Those representatives of Mr. Mahinda Rajapaksa started with submitting four demands related to the forthcoming elections. The first demand was to appoint Mr. Mahinda Rajapaksa as the Prime Minister after the election and to name him as the Prime Minister candidate. Next was to oppose some proposals presented in the Parliament. At that meeting held in the Parliament, I point blankly rejected the demand to appoint Mr. Rajapaksa as the Prime Minister or to nominate him as the Prime Minister candidate. I said that I disagree with the requests. Then the representatives queried why I opposed the requests. I said I do not wish to reverse the January 8th victory. Subsequently I said to him that there is a wave of political culture sweeping universally against corruption and abuse of power. I told him that educated, intelligent, middle class placed confidence in me for good governance. While I pursued good governance he lacked these qualities. I said that the youth will not vote for him because of his faults, family bandysm. Therefore, I requested him not to make the party to lose at the election by contesting. This meeting concluded without any result. In the meantime, we continued to work as a government & Parliament. The election came closer. By then the 19th Amendment has been passed. The political parties including UNP, JVP, TNA, SLMC, Sarath Fonseka’s party and I with other organizations that supported me to win had the largest interest to pass the 19th Amendment. When the 19th Amendment was to be passed UPFA members queried where the 20th Amendment to change the election system was. I wanted their votes to pass the 19th Amendment. I stated that the 19th Amendment was gazetted and the current law does not permit to consider 19th & 20th Amendments together as the 19th Amendment has been gazetted and being considered by the Supreme Court and the 20th Amendment should come up separately. The UPFA Parliamentarians agreed to vote for the 19th Amendment on the promise that the 20th Amendment would be brought up. I discussed with Mr. Ranil Wickremesinghe and others in the government and told them that if UPFA support for the 19th Amendment is to be mobilized 20th Amendment also has to be brought up. They agreed. Hence, having passed the 19th Amendment, I was awaiting the arrival of the 20th Amendment. I did not prepare the 19th Amendment. 19th Amendment was prepared with my concurrence and total agreement by experts. I queried where the 20th Amendment was. UPFA Parliamentarians inquired where the 20th Amendment was. Twentieth Amendment has been dropped! You remember that we stated in the Manifesto that 19th & 20th Amendments, Right to Information Act and Audit Act will be passed after the elections. The Audit Act & Right to Information Acts were drafted. The 20th was dropped by the 19th drafters. Right to Information and Audit Acts did not exist. When we discuss on corruption in the state sector we find a very corrupt tender process. I have been saying this for more than ten years. I had experienced this when I was the Minister of Agriculture and Health. The whole country knows it. To erase corruption in tendering, to create a good financial management system, to create a corruption free tendering process and to inculcate financial discipline the Audit Act was to be introduced. But there was no 20th Amendment; no Right to Information Act; no Audit Act! Concurrently, an allegation cropped up regarding the Governor of the Central Bank. A Committee was appointed and a report was produced. The Parliamentary Accounts Committee commenced action on it. In my mind and in the public eye there is a conceived notion that Mr. Ranil Wickremesinghe is not a rogue; does not steal. When the Central Bank Governor’s issue was discussed occasionally and lately I told him that he has a good name and in this instance too he should be doing the correct thing. I suggested that the best option is for the Central Bank Governor to resign. This was the background situation that prevailed up to the nomination process. I must state that at elections each party chooses a candidate according to their respective party constitutions and policies. The process of choosing a candidate in the SLFP is only known by those within the party. Those with the UNP know how the UNP chooses a candidate. In the case of the SLFP and UPFA, we first call for applications. Then a Nominations Board is appointed for selection. The nominations are thereafter approved by the Central Committee. This is the current process. I made it very clear to everyone that I do not approve appointing Mr. Mahinda Rajapaksa as a candidate. In this room, I informed UPFA leaders Dinesh Gunewardane, Vasudeva Nanayakkara, Wimal Weerawansha’s party, Tissa Vitharana, D. E. W. Gunasekera, the Mahajana Party and Mr. Podi Appuhamy’s party that I did not wish to give Mahinda Rajapaksa the positions of Prime Minister, or the Team Leadership. If the wooden walls in this room could speak out, they will repeat what I said. I clearly told the leaders of UPFA who were not satisfied and left speaking ill of me after the meeting. This condition prevailed within the SLFP as well. Due to this status I was left with two options. One was to totally handover the SLFP to Mr. Mahinda Rajapaksa and resign from the party leadership. If I did so, Mr. Mahinda Rajapaksa would have been appointed the Leader of SLFP and UPFA within seconds. I know that although they gave me the Party leadership on January 16th, two weeks later Mr. Mahinda Rajapaksa began to deeply regret the decision. If I resigned from the SLFP Mr. Mahinda Rajapaksa would have contested this election as the President of the SLFP and President of the UPFA. Not only that, he would have nominated people of his choice as candidates from the districts, he would have dictated the nomination process 100%. He would have even deleted all the names of members of the party who supported me. He would have kicked them off. In this situation when there was a split I could have resigned from presidency of SLFP & UPFA. Mr. Mahinda Rajapaksa would have become the Leader of both, as I stated earlier. You would have observed a clear difference in Mahinda Rajapaksa’s behavior than yesterday when he handed over nominations, if that was the case. I’m certain of it. I do not say that Mr. Mahinda Rajapaksa is powerful even today. Mahinda Rajapaksa who was defeated on January 8th will be defeated again. But if he did receive the UPFA’s leadership he would have been little more powerful. When I said that the candidacy will not be given they had it all planned to contest from a different party. They had prepared the lists of candidates and even a Manifesto Committee. If they did not receive nominations from the UPFA still they could have contested from another party and come to Parliament and it could not have been stopped. People question why I gave nominations to Mahinda Rajapaksa from the UPFA. 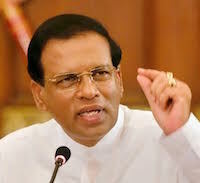 I must tell you that I could have split a faction of the SLFP easily and gone around the country with that piece. But that isn’t something a President should do. If you look at the history of this country you may notice that the two-party system has existed in our country. Other parties have sometimes worked in parallel or come along directly or indirectly and some have taken the middle path within the existing two-party system. From 1956, UNP & SLFP have ruled this country. Under the two-party system when one party was weakened the country’s democracy and peace faced crisis. I’m not a soothsayer, or an astrologer, but anyone with an understanding of our country’s political history for five decades knows this. In 1970 the UNP faced a critical crisis when its numbers fell to 7 or 8. In 1972, Mr. J. R. Jayewardene wished to join Madam Sirima Bandaranaike Government. Mr. Felix R. D. Bandaranaike & Dr. N. M. Perera objected and the request was thwarted. If not, Mr. J. R. Jayewardene would have been a Member in Madam Bandaranaike’s Cabinet in 1972. In 1970 when the UNP was extremely weakened, the government which was elected for five years under the 1972 Constitution was extended by two more years – to seven years. If an election was held in 1975, UNP would have won due to the status of the country after insurgency of 1971 and the existed socio-economic background. But a strong opposition would have been formed. My much respected leader Madam Bandaranaike’s move made UNP to win a 5/6 victory in 1977. If the election was held in 1975, the UNP would not have received even a 2/3 majority. Because the government tenure was extended by two years, with added displeasure due to socio-economic crisis, 1971 insurgency, corruption etc., UNP received 5/6 majority. SLFP was reduced to eight seats. Due to this, the whole political crisis we experience now occurred after 1977, due to JR Jayewardene Government ruling the country for twelve years. We now discuss about a person. We discuss Mahinda Rajapaksa. It is not one person- Mahinda Rajapaksa. One has to dissect the whole crisis. After 1977, with 5/6 victory, the UNP introduced the 1978 new Constitution; the Executive Presidency system; indecent preferential voting system. The political culture in the country was destroyed by the indecent preferential voting system. Politicians are blamed. True, they must know how to conduct elections honestly. The fleeing of honesty is due to inability to face the system. I believe that I faced it honestly. I have been in Parliament for 26 years. Having being a Minister I know the confidence placed on me by the people of this country, because I stood against this system and was honorable, uncorrupt and did not abuse power and it is why people decided to accept me as the Common Candidate to elect me as the President. 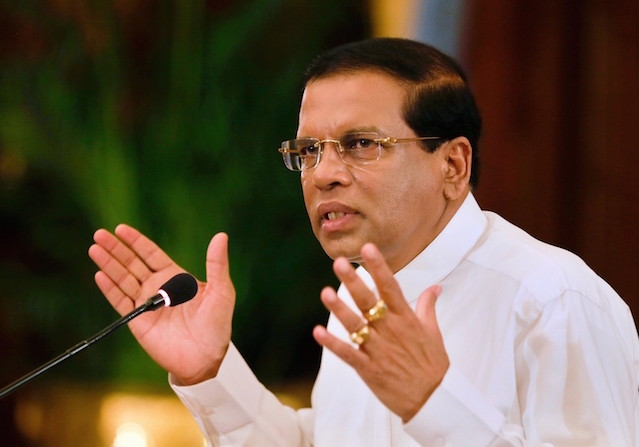 I remember before 8th January UPFA speakers said at meetings “How can Maithripala Sirisena become the President? Before that he should be Prime Minister and Leader of the Opposition. No one has become the President without being the Prime Minister or Opposition Leader in the country”. They argued so. Mr. Mahinda Rajapaksa is the only President in our history who contested a Presidential election and was defeated. Other Presidents respectfully left office after their two terms tenure. He broke this record and became the “first defeated President”. I explained what the J. R. Jayewardene administration did with a 5/6 majority. There were many serious issues related to democracy & freedom. Those who knew of their twelve years rule know these. I do not want to take time to explain them. Next, observe the 2010 election results. With it the UNP totally crumbled. With the party crisis UNP could not retain even the parliamentary seats it won. Mr. Mahinda Rajapaksa in one stroke took away 21 or 22 members and offered them portfolios. What I am saying is how the party in power behaved in a two-party system, whenever the other was weak, whoever was in power. I am restating history. What was the result of 2010 results? When the UNP crumbled and some crossed over, the Executive Presidency was converted into a Monarchy System through the 18th Amendment. If the UNP was strong as an opposition the 18th Amendment would not have been possible. Because it was weak the 18th Amendment went through. From 1947 onwards, in 1970 – 1977 UNP was extremely weakened. From 1977 onwards the SLFP was weakened and split into two or three. After 2010 the UNP was extremely weakened and split. Every time a party under the two-party system weakened democracy and freedom were faced with crisis. My stance did not change. My opposition has not changed. I expressed my opposition to them. I told them to arrive at a majority decision without splitting the party. But I am not with this decision. In this background, earlier I explained to those who were disappointed of me how I formed and ran a government for six months with a Prime Minister supported by only forty-seven parliamentarians. I explained how I opened the doors of good governance, how the plans in my mind were developed. So I must make it very clear to you that my sole interest in the next election results would not be about which party will receive the majority of seats out of the 225 elected to the Parliament, but to ensure the agenda that I promised to the people on January 8th will be taken forward with the support of the Parliament. This is my objective. I act to reach this objective. I do not wish to walk back. I walked out on 21st November last year having sacrificed everything. I compare myself as a person who jumped into the deep ocean from a ship with my family. Steering the ship of government in the last six months was akin to my being at the helm of the Titanic. But, unlike the disastrous voyage of the Titanic, I did not let the ship sink. When the government was about to sink, with the No Confidence Motion on the Prime Minister, I dissolved the Parliament. What was the insidious plan of the No Confidence Motion against the Prime Minister? According to my information, the plan was to include it in the Order Paper, then for someone from the UPFA National List to resign and appoint Mr. Mahinda Rajapaksa in lieu, to defeat Prime Minister Ranil Wickremesinghe through the No Confidence Motion and for their faction to form their own government. I defeated that too. This is why I said about how a government with just forty-seven Members of Parliament ruled and kept the promises I made in my Election Manifesto, how I changed the constitution, as I promised; passed bills and endowed the benefits to the people, how I also had to face the crises within the party. I did all this to confirm the victory of the 8th of January. It was all done with clean hands, and honesty. That’s my objective and determination. That’s my goal. So those who review must do it very carefully. Criticism is easy. I applaud criticism. I have no problems with those critics. In a democratic country, criticism is essential. Free media is essential. The clause on media in the 19th Amendment draft regarding media was removed by me; on my demand. I have carried my responsibility up to date. And I will continue to do so. I must state very clearly that in the forthcoming election campaign I have no transactions with Mr. Mahinda Rajapaksa. The resistance that I had towards him before January 8th still remains the same. If the UPFA wins this election, there are enough seniors to be appointed as the Prime Minister, instead of Mr. Mahinda Rajapaksa. When Mr. Mahinda Rajapaksa was the President, he made it impossible for anyone else to be President during his life time, by removing the limitations on the number of terms in office. This way he could have been the President as long as he was alive. No limitations. Now he wants to take away the opportunities of other seniors in the party to be the Prime Minister. I must say very clearly that I will remain in a neutral position during the forthcoming election. I will commit my support to the Elections Commissioner, the Armed Forces, Police and public officers to conduct a genuinely free, fair and democratic election. Following the General Election I hope to spend the next five years performing my duties by keeping the promises I made on January 8th. The Manifesto is for five years and will not end in six months or 100 days. I’m certain I will receive the people’s certificates for doing so at the end of those five years. I know those who criticize me will soon realize this. I will happily face these challenges with my forty-nine years of experience in politics. Your criticism of me in the past few days reflect the blossoming of democracy in this country and how you are making use of the massive outpour of blooming democracy in this country. I am very happy that I was able to restore the freedom of expression in this country which I gave you. But, I urge you to enjoy that freedom with a sense of responsibility. *Note – The transcript of the speech which was provided by the President’s Media Division had some errors. We have replaced the finalised version again sent to us by the President’s Media Division. *The transcript of the speech was provided by the President’s Media Division. It looks to me like Sirisena thinks all Sri Lankan’s are fools? “It looks to me like Sirisena thinks all Sri Lankan’s are fools?”. Read carefully Native Vedda underline the word ‘all’. Are all Sri Lankans fools? All means 100% of Sri Lankans fools. While appreciating CT for publishing President’s speech, this translation has missed the following important points mentioned. I think these are important omissions as President Sirisena not only blamed MR, but also blamed RW and the UNP. THIS GUY IS DUM SR LANKA HAD FREEDOM THANKS TO MAHINDA . THIS GUY IS SMOKING.THIS DUMMI IS TELLING COUNTRY IS PEACE FULL NOW. THANKS TO ARE MAHINDA . I CANT BELIVE THIS GUY HAS NOT PASS EIGHT GRADE AND BEEN SRI LANKEN PRESIDENT.